Again I want to note that I am not qualified to talk about such a holy place as Sanket. I feel my lack that I’m sitting here. There are many of my much more qualified Godbrothers who could discuss the games that are taking place here and this place. This is my first stay in Sanket for the last 40 years of visiting the dham. I’m surprised that we never came here. My first impression was that it was a small quiet Vrindavan village. It is located between Warsaw and Nandagram. 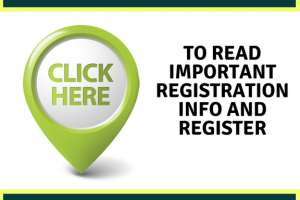 Here, as well as hundreds and thousands of years ago, are engaged in agriculture. Also my first impression was that the villagers are very friendly towards us. 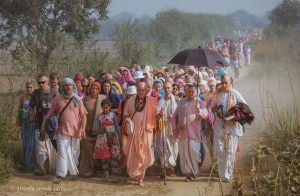 When we entered this village, they did not treat us as outsiders, they accepted us as members of their family, and greeted us with exclamations: “Jaya Radhe, Hare Krishna, Haribol!” Before the bus arrived, I wandered around the village in the search for a place where we could hold sat-sangu. First I went to the Sunqué devi-mandir – this is the biggest temple here. But there was not much room. Sanket-devi is the embodiment of Yoga-maya. In this village she is present in the form of Durga.At the same time, it is considered non-different from the gopis called Vira-devi. As I understand, Vira-devi is one of the most important assistants of Vrinda-devi, who is responsible for organizing the most intimate games that take place here in Sanket. Then I reached Krishna-kunda, this is a large lake that is in the forest and there is nowhere to sit down. Then we proceeded to Julian Steel, where Radha and Krishna are swinging on a swing. Then we proceeded to a large mandala, it is now flat, it seems to want to be covered with marble, this is a mandala race where Radha and Krishna dance a dance of race. Then the Lord sent us from the heart to the bhajan-kutiri Gopal Bhatta Gosvami. And we passed, I can not say that by chance, because nothing happens in Vrndavana, we passed the place where Radha-Sanketbihari Mandir stands, where there are wonderful Radha-Krishnabihari Deities, which means, He who enjoys. As soon as we stopped at this place, the residents greeted us very warmly and you can live here, you see many rooms here. 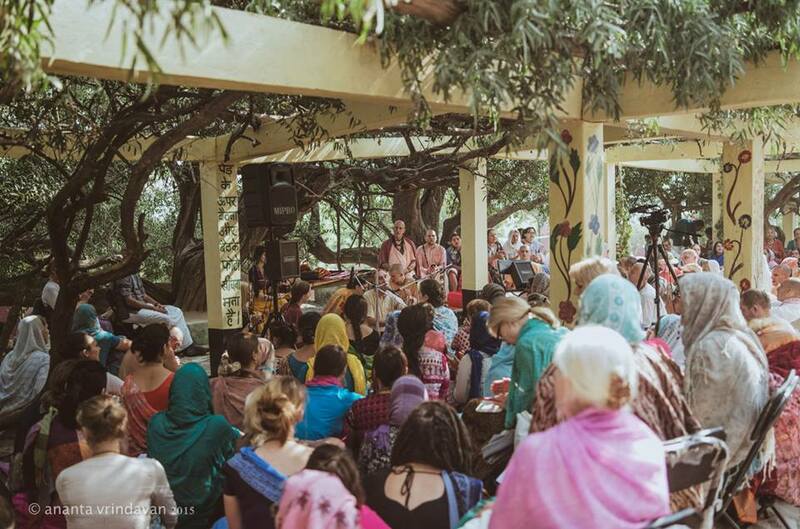 Residents began to inspire us to look at the Deities, to spend kirtan. They immediately spread out the rugs. By the great mercy of Srila Prabhupada we are sitting today in this holy place. Sanket is mentioned in the Puranas as one of the forests, such a small forest of Vrndavana. It is part of the large Sankat-van forest. Sanket means a meeting place, which is indicated by signals using mirrors. Gosvami Vrndavana described that Radharani being in Warsaw, and Krishna in Nandagram, they send signals to each other with the help of mirrors about the meeting. This meeting is called sambhog. There are two moods of Radha and Krishna, one is called sambhog, this is the mood when they meet, and the other is vipralambha, love in separation. 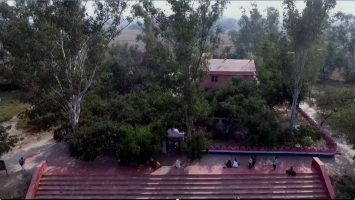 You remember that we visited the forest of Prema-van, this is a forest of love and in the middle of this forest there is a lake of love – Prema-Sarovar. Hardly we can forget a wonderful game, as this lake appeared. Radha and Krishna felt such a strong sense of separation that their tears mingled with each other and with the tears of the gopis and formed this wonderful lake. In Prema-vana Radha and Krishna are in a mood of separation, but here they meet in Sanketa-vana. I found a beautiful quote from Visvanatha Cakravarti Thakura, where he writes that he believes that Sankata-van is the personification of the divine love of Radha and Krishna when They meet.We remember that there are 4 kinds of separation, which we discussed not so long ago and also there are 4 types of love meeting. This is the science of devotional service. Devotional service is not just some sentiments, it’s very deep emotions that are based on a solid philosophy, one might even say – in scientific philosophy. Visvanatha Cakravarti Thakura describes the Sabbah, the meeting that it consists of 4 kinds of meetings. The first kind is when Radha and Krishna just matured and developed a great sense of love for each other. The second kind is after Radharani calms down after his anger. Sometimes Radharani becomes angry with Krsna and after Krsna appeases her, they meet again. The third kind is when They meet after They have been separated for a while. This can be when Krishna is away for some time and they meet again. The fourth kind is a meeting when Krsna returns after a long absence. For example, Krsna comes back from Dvaraka or Mathura, or Hastinapura, ie. He was absent for some time, which seemed to be gopi for an eternity. A good example of this is the meeting of the gopis and Krishna in Kuruksetra during the eclipse.They asked Krsna, “Krishna, you look different, where is your peacock feather, why are you dressed like a prince, why on your head is the crown, where is your flute, will you return with us to Vrndavana?” Krishna for as long as he did many things: He married thousands of princesses, He built the palaces of Dvaraka, took part in many battles and defeated them. After the gopis met Krsna, they were surprised that Krsna was walking with a weapon, wearing a helmet, they asked him to put on a yellow dhoti, because only then Krishna could become himself. 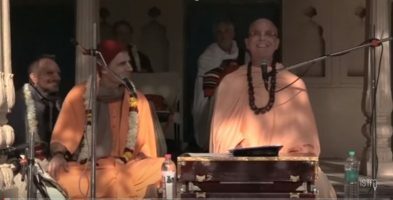 We can not imagine the feelings of the gopis, because Lord Caitanya in the “Siksastak” describes that even one moment of separation from the Lord seems to be an eternity for the devotee, therefore, if we combine these moments with each other, we can not even imagine, How happy the gopis were when they met with Krsna. Bhaktivinod Thakura describes Kuruksetra as one of the most sacred places for Vaisnavas, precisely because of these emotions. Kurukshetra is now a very popular place, because the Bhagavad-gita was told there, many tourists come there, but we go there because we want to better understand the feelings of the residents of Vrndavana. Krishna says in the Bhagavad-gita that His devotee sees Him everywhere, but especially those who want to develop the mood of the bridzhabashi like to listen to all the pastimes of Krsna, but especially they seek to understand Krsna’s mood in Vrndavana.This is one of the deepest understandings of the Ratha Yatra festival, when we take Lord Krishna, Balarama and Subhadra back to Vrndavana after a whole eternity of separation from them. Devotees keep this in mind all the time, because it’s not just a feast, a meeting with friends, a big festival show, it’s a deep mood that we have to meditate on and then we can develop Krsna consciousness. Advanced Vaisnavas try not to understand what is important, because it is an exalted subject, but to appreciate the mood of Lord Caitanya during the Ratha Yatra festival, because Lord Caitanya is the embodiment of Radharani’s love, and Lord Jagannath is Krishna Himself. During the Ratha-yatra, Lord Caitanya dances in ecstasy before the chariot, and between Him and the Lord there is a profound interchange of love, and sometimes because of this interchange, Lord Jagannatha stops his chariot, and no one can move it: neither city dwellers nor elephants, because there is an interchange of love between Radha and Krishna. No one knows these things better than Srila Prabhupada. He gave us this festival of ratha-yatra, as a preaching program.What is the significance of Sanket in the 4 sections of sambhogi? Sanket is the very first place where Radha and Krishna met, when They only matured and developed a great transcendental desire for each other. The acaryas describe that although each meeting of Radha and Krishna is eternally fresh and inspiring, however, their first encounter was especially unique. So unique that Krishna forever remembered it. Sometimes He told His closest devotees, Svia, the first meeting with Sri Radha in Sanket. One day Krishna told Visakha, “Oh, my friend, when I started joking with Radharani during our first meeting, She began to stutter.” Even in Dvaraka, where Krsna was playing games with His queens, whenever He began to describe His first encounter with Srimati Radharani, the grief of separation was so overwhelming to Him that He fell silent, unable to continue. Their first meeting, when they grew up a little, occurred during the rainy season. Why is such a unique event, like the first meeting, occurred during the rainy season? Because of the rain, the bridzhabasi was difficult to move around the village and Radha and Krishna used this to meet. Due to bad weather, it was easier for them to meet between Nandagram and Warsaw. The acaryas describe that the night before Radharani and Krishna met, Radharani’s affection for Krsna, Her desire and anticipation of meeting Him was so strong that She could not sleep. She walked back and forth in her room to the surprise of Swich’s girlfriends. Mother Purnamasi, who organizes all meetings and games in Vrndavana, arranged so that the first meeting of the Divine couple took place on the night of the dark moon, when the Moon is just beginning to grow. All the signals were transmitted by mirrors, messages were transmitted through the gopis and through the cowherd boys, and before going out to the meeting, which was scheduled for about midnight, Radharani plastered her body with black musk. She wore a dark blue sari. Govinda das Thakura describes: “O Radha, Your shining necklace, bracelets and clothes, they are all black. All lotus flowers, by which You passed, all the bumblebees that flew past You and even the night itself became darker. “ During the full moon, Radharani wears white clothes, takes a white lotus flower and even bees that curl around her – a white color. The question arises, how could Radharani see on a dark night? When we go to parikramy in the evenings, it is generally difficult for us to see anything. Last night I went to the parikrama in Nityanandavat. When Lord Nityananda came to Vrndavana, He sat under this tree and sang holy names. We also went there and repeated japa there. We were 5-6 people and some of them walked barefoot, and I asked how they can walk barefoot on the rocks.When we went down to Kalia-ghat, where the asphalt begins, one devotee pushed me away and said that there was a deadly spider. We recoiled, and I saw a dark brown spider, the size of a bottle cap. There are many dangerous living beings in Vrndavana here. There are cobra, similar to a lizard, but it is 12 times more toxic than a normal cobra. I saw one such in the 70s. Madhura-bihari described that even the breath of this spider is enough to kill, but scientifically it is not proven, but if it bites, then in 5 minutes you will die and there is no antidote from his bite. And this spider just strolled, and we walked at night barefoot. Since there were many pilgrims, I began to push this spider away with my stick, but Madhura Bihari stopped me and said that this spider is a bridzhabashi, you can not treat him like that, he took a small twig, planted a spider on it and dropped it somewhere in side. And I saw a dangerous creature in this spider, and Madhura-bihari saw him as a bridzhabashi. Yesterday, when we were at Radha-kunda, I saw a snake in the water, and I thought that in the west the children would throw rocks at it, but here the children recoiled and they just shouted that the snake was in the water. Of course, if there is a risk of a snake bite, the villagers usually kill snakes in order to protect their families and animals. Radharani goes out at night and the night is such that even though the eye is pierced. How does She find the way? Acaryas very poetically describe how She found the way to Sanket. They say that love itself, madhurya-rasa, as a compass pointed Radharani direction. And just as this embodied love led Radharani, she led to Sanket and Krsna Himself. Krsna came first. Krishna began to put the finishing touches on, although Vrinda-devi and Purnamasi had met in Vrinda-kunda, in particular the Gupta-kunda, in the morning, everything was discussed and organized, but Krishna did the last check, said something to the birds to arrange a worthy meeting of Radharani . With the finishing touches He adorned the beautiful kunja with beautiful ornaments.And what kind of decoration was it? It was the sound of the name Radha. The names of Radharani were sung everywhere, and this was the last ornament of the kunja. And suddenly, although it was a quiet and peaceful night, the lightning flashed, and lit up all the kunja, and Krsna saw how Srimati Radharani and all his gopi friends enter the kunja. It was their first meeting at their age and They could not say anything because it was their first meeting, They just drank the nectar of beauty each other and the nectar of love for each other. The acaryas say that they simply exchanged loving glances. And They already began to approach each other, but then the Goddess of modesty stopped Them. Inspired by His friends, Radharani went to Krishna, and Krsna came to Her, and They embraced in this very place. Then the gopis quietly left, leaving Radha and Krishna alone, and then I will not speak, because the depth of our awareness is not enough. In Srimad Bhagavatam there is a wonderful verse that says that even if a person has material desires in the heart, in particular lust, then, by listening to these endless, wonderful games of Radha and Krishna, about games in which there is a so-called a lust that is absolutely transcendent, then these material desires are destroyed, so we must listen to these games, and for this there is no better place than Sanket, the place of the first meeting of the sabhoga. Sri Caitanya Mahaprabhu also visited Sanket during His parikrama in Vrndavana. He sat here under a large stone and listened to these games. As I mentioned, Gopal Bhatta Goswami lived here in Sanket in an underground cave for many years. It was not far from the big temple of Sanket Devi, there Gopal Bhatta was immersed in the games taking place here. Hare Krsna. 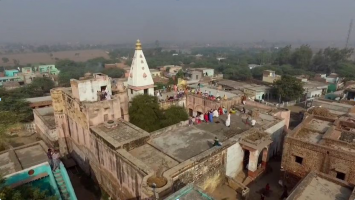 Nearby there is a place of Radha Nagari, it is not very well known, and not many devotees visit it.This secret place is named after the gopis, who are called Radha Nagari. Since this place is only 100 meters away, I also want to touch upon the games that were taking place there. I found this touching game and it shows how Radharani is merciful to His devotees. We discussed how Radharani and Krishna met in Sanket. These games lasted all night. These games take place in different kunjas, in different places. At the end of the night, Radha and Krishna are sleeping peacefully, and one of the services of Vrinda-devi is to awaken the Divine Chet. After awakening, Radha and Krishna must quickly return to their homes so that their relatives will not notice their absence. When Radha returns home, many Her friends of the gopis follow her, who help her sneak into the house unnoticed. Then all these gopis go to their homes to also slip unnoticed. This gopi, Radha Nagari, when she returned home, was seen by her relatives and they began to think where she had been absent all night and the next day they forbade her to go and serve Radharani. And this young girl, who was excommunicated from her ministry, stood all day in her room crying. This is similar to the case when many gopis of their relatives forbade going on a beautiful autumn night to dance the race. The gopis, who were not allowed to enter Krishna, felt such a strong separation that some of them left their bodies and went to Goloka Vrndavana. The next morning, Radharani went to prepare for Krishna, and all the gopis were with Her, but someone noticed that Radha Nagari is not with them and reported this to Radharani. They said that relatives suspected her of something, because she was out all night. Radharani immediately turned off the path, although She was preparing to cook for Krishna, but She turned to the house of Radha Nagari, and She had some weighty arguments to explain to Radha Nagari’s relatives of her absence from the night. Radharani told Radha-nagari’s family that yesterday she had a bad cold and Radha Nagari was so kind that she came and looked after her all night, she helped She, and at the end of the night Radharani sent her home, and so she returned so late . Goswamis describe that when the relatives of Radha-nagari saw the innocent face of Srimati Radharani, they heard Her persuasive words, their hearts melted. And they allowed their daughter to go with the princess of Vraja to Nandagram.Since then, the name Radha-nagari has been associated with devotees who are the object of the special mercy and love of Srimati Radharani. Entering the circle of servants of Srimati Radharani is the rarest perfection. But to receive service from Srimati Radharani is a special favor, a special blessing, a special perfection that Radha Nagari received. Devotees who know about this game go to this place of Radha-nagari and pray to Srimati Radharani for special mercy, that She will take them to serve, that She will turn from her path and take care of them. Vrindavaneshvari Srimati Radharani ki jay. Shri Shyamasundar ki jay! Sri Radha-Shyam ki jay!